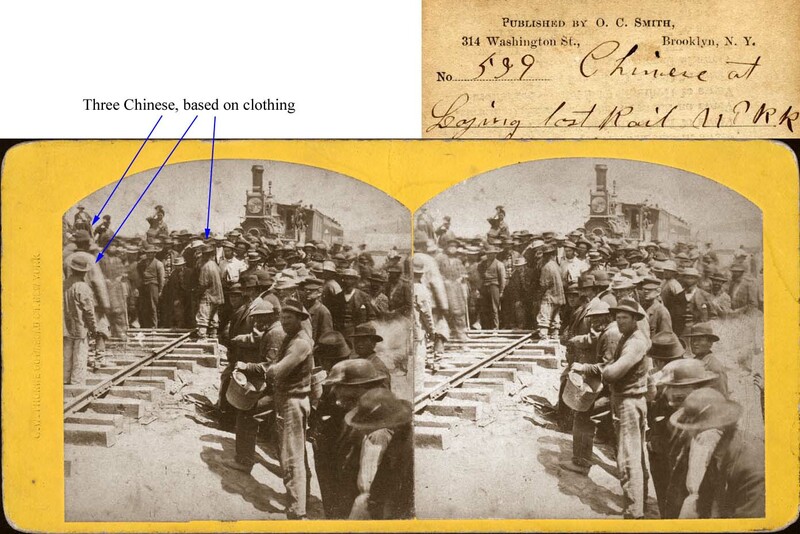 The claim that the A. J. Russell Stereoview #539. depicts "Chinese at Laying Last Rail UPRR," is based on the primary source manuscript verbatim quotation of the photographer's caption for his photograph as shown in on the back of the photograph which is displayed next to the image. The image is shown in its entirety as originally published in the 19th century. For details about the events depicted in the image, see Driving the Last Spike At Promontory, 1869 by J. N. Bowman. Attached is a copy of the photo with the three Chinese that are clearly visible (out of the total Chinese crew of eight) identified. As noted below, photographer A. J. Russell's identification of the photo as showing Chinese is the most substantial evidence. Within the photo, the distinctive jackets worn by the Chinese help identify the individuals, as well as the general cut of their clothes over all. After looking at a large number of photos of Chinese from the period, particularly in numerous A. A. Hart photos of the Central Pacific RR construction, one grows familiar with how they appear in the photos. Also, from the Sacramento Daily Bee, May 12, 1869, quoting from the [San Francisco] Alta's dispatch of the proceedings at the front when the last spike was driven: "J.H. Strobridge, Superintendent of Construction of the Central Pacific entertained the Press and the officers of the 21st Regiment, and others most sumptuously. When the other guests arose from the table Mr. Strobridge introduced his Chinese foreman and leader who had been with him so long, and took the head of the table. This manly and honorable proceeding was hailed with three rousing cheers by the Caucasian guests, military and civilians, who crowded around Strobridge to congratulate and assure him of sympathy." I wish to clarify that the comments posted in the caption were details that I found interesting in the view and were left in an unedited format. To further expand on the context of this particular image and its significance, one must look at all the other photographs that exist of this event to see that no Chinese workers appear anywhere, not even in the background. I'm not aware of this stereoview appearing in any book, public collection, or database and have seen only one other copy besides the one in my collection. A thanks to Phil Anderson for his generosity in allowing this rare and important image to be shown. See, Chinese Builders of Gold Mountain video.